The microbial fuel cells are essentially modified H cells that are used with different membranes between the flanges. Glass bottles are used. The connections consist of glass threads and sealing rings for holding electrodes. In other configurations, a septum may be used for sampling or probes. 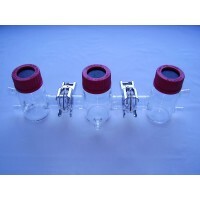 These cells are made of borosilicate glass with GL14 insertion tube. Typically, we deliver these as blanks in 100 ml and 250 ml volumes with three different porting options: tubing, Teflon-coated silicone septum sampling probes, and o-ring gaskets. 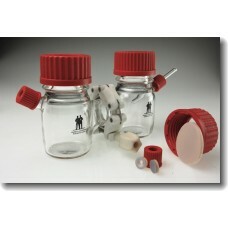 We sell these cells as a set, consisting of two cell halves. The standard side ports are GL14 threads and the large bottle opening is a GL45 thread, all of which can be closed with either closed or open caps. We also offer sealing rings around electrodes or hoses. Alternative we can offer crimp closures instead of screw caps. Three-chamber microbial fuel cell with three GL14 connections per chamber and middle chamber. The ch..